I wasn't able to attend the IPP in Japan last year however given that I was getting married, I had a great excuse, and I'm not complaining about my choice of location. It did mean however that I missed out on a number of new puzzles from the IPP. Fortunately, I have a few friends who did go, and I was able to borrow some of the Japan Puzzles. 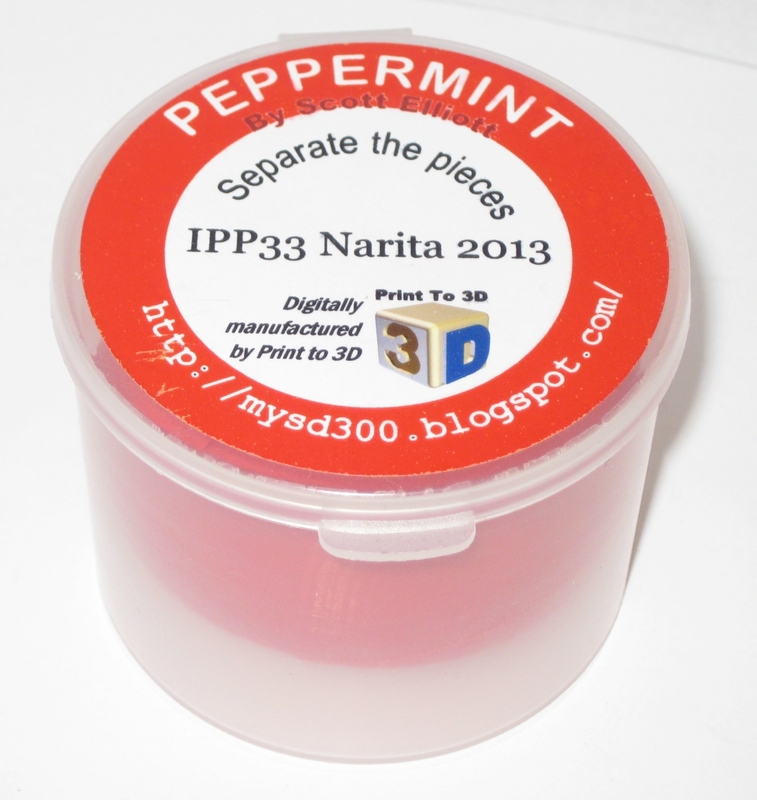 Peppermint is a 3D printed puzzle designed by Scott Elliot for the Puzzle Exchange, and was digitally manufactured in colorful ABS by Bradley Rigdon at PrintTo3D according to Scott. Peppermint. An exchange puzzle from Scott Elliot. You can read all about the design process for the puzzle over on Scott's blog here if you're interested. I certainly recommend it as it really shows the work that goes into refining a puzzle design. The finished puzzle measures 2.25" x 1.75", and seems like a fairly large puzzle in your hands. The puzzle consists of four pieces, which combine together into two linked sub assemblies. 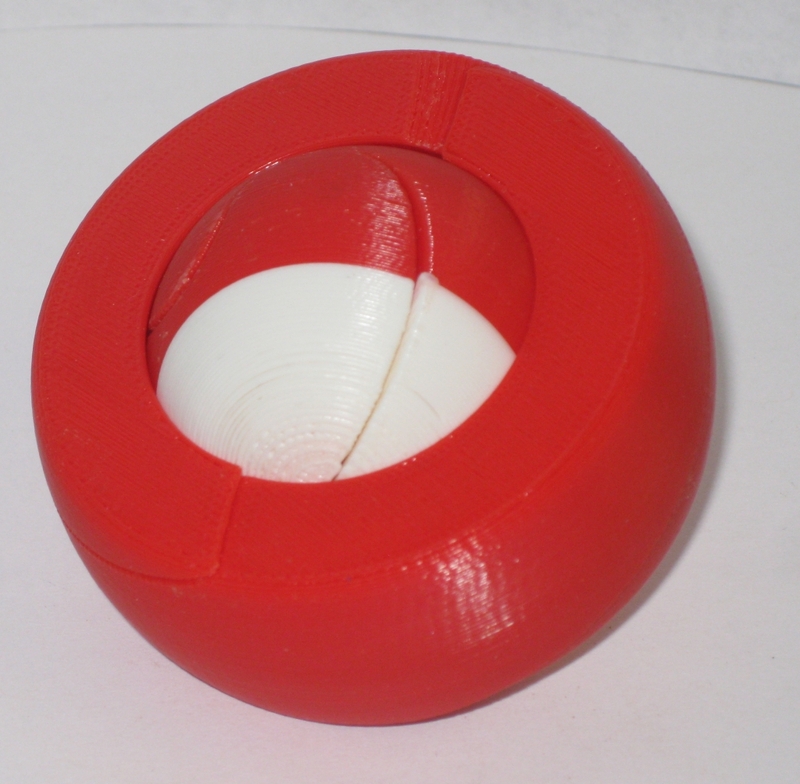 The outer shell doesn't move, while the sphere in the centre is free to rotate around. If you're familiar with the Cast Marble from Hanayama, then you'll have a fair idea of what's going on here. The difference is that you can only see the sphere from one side of the puzzle. On the other side is a closed dome that hides the sphere away. Peppermint. Taking the pieces apart. Once you've found the right alignment of all the pieces, it will rotate apart smoothly, before coming apart into four separate pieces. Putting it back together is a simple case of reversing the process. there is a little bit of thought required to align the pieces correctly, but nothing that will stump you for long. Peppermint. Showing off the sub assemblies. Overall it's a fun puzzle and it looks great in the vibrant colours of the ABS plastic. 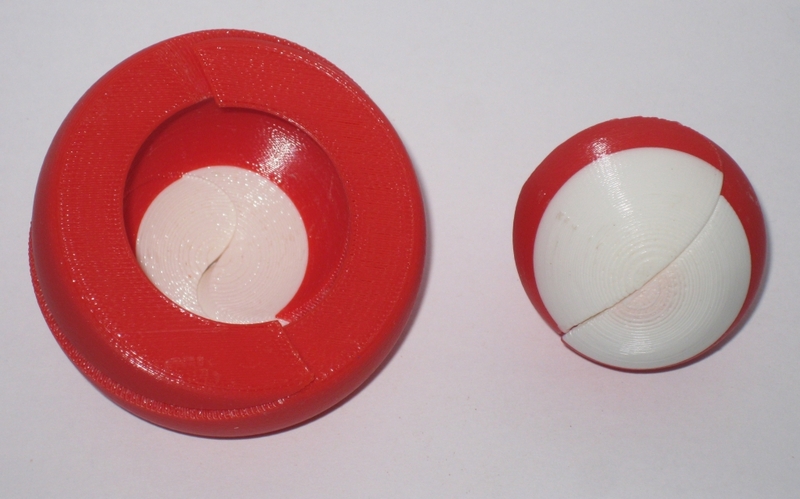 I'm seeing more and more puzzles being produced by 3D printers, and the quality is really impressive. For rapid prototyping, and the ability to play with designs just hours after they are conceived is incredible. I don't see it replacing the feel and look of natural wood, but I can't deny that it's an amazing technology.